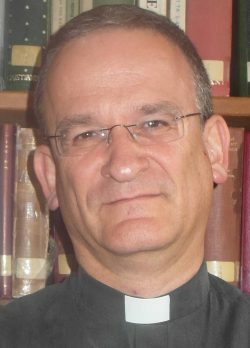 A Jesuit since 1992 and a priest since 2000, Fr. Neuhaus was born in South Africa and has lived for most of his life in Israel. He holds an M.A. and PhD in Political Science from Hebrew University, and Pontifical License from the Pontifical Biblical Institute in Rome. As a professor he has taught at the Seminary of the Latin Catholic Patriarchate and Bethlehem University. Writing from the Holy Land, Jerusalem, STS Publications, 2017. Holy Land: A Pilgrim’s Guide Book, (with Biju Michael and Lionel Goh), Jerusalem, STS Publications, 2017 (in multiple languages). Je vous écris de la Terre Sainte, Paris, Bayard Presse, 2017. Nata’arifu ‘ala al-Qadis Bulus wa-rasa’ilihi (Let us get to know Saint Paul and his epistles) Beit Jala, Manshurat Maktabat Yasu’ al-Malik, 2016. Nata’arifu ‘ala Asfar al-Hikma (Let us get to know the Books of Wisdom) Beit Jala, Manshurat Maktabat Yasu’ al-Malik, 2015. Nata’arifu ‘ala Sifr al-Ru’iya’ (Let us get to know the Book of Revelation) Beit Jala, Manshurat Maktabat Yasu’ al-Malik, 2014. Nata’arifu ‘ala Sifr A’amal ar-Rusul (Let us get to know the Book of the Acts of the Apostles) Beit Jala, Manshurat Maktabat Yasu’ al-Malik, 2014. Nata’arifu ‘ala Yasu’ min hilal Injil al-Qadis Luqa (Let us get to know Jesus by means of the Gospel of Saint Luke) Beit Jala, Manshurat Maktabat Yasu’ al-Malik, 2013. Lehakir et Toldot haYeshu’a, Beit Jala, Latin Patriarchate Printing Press, 2012. Haker et Se’udat ha’Adon, Beit Jala, Latin Patriarchate Printing Press, 2012. Haker et haHaggim wehaMoadim baKnaysiyah (Get to Know the Feasts and the Seasons in the Church), Beit Jala, Latin Patriarchate Printing Press, 2011. Haker et haKnaysiyah (Get to Know the Church), Beit Jala, Latin Patriarchate Printing Press, 2010. Eydot Notsriyot Berets HaQodesh (Christian Communities in the Holy Land) (Jerusalem, Jerusalem Center for Jewish Christian Relations, 2009). Yemay Zikaron weHagigah beLuah haShanah HaNotsri (Days of Memorial and Celebration in the Christian Calendar) (Jerusalem, Jerusalem Center for Jewish Christian Relations, 2008). Mercy: A Christian Way of Life – Essays in Honor of Dr. Biju Michael SDB, editors with Romero D’Souza, Jerusalem, STS Publications, 2017. “Un ricordo di padre Marcel Dubois,” in Marcel-Jacques Dubois, La spiritualità del giudaismo, Milan, Edizione Terra Santa, 2017, 7-14. “Ar-rahmah wa-ar-rafah” (Mercy and compassion) in Rafiq Khoury (ed), Ta’amulat fi ar-rahmah (Meditations on Mercy), Beit Jala, Manshurat Maktabat Yasu’ al-Malik, 2015, 16-20. “Jewish-Christian Dialogue in Israel Today: When Jews are the Majority,” in Ron Kronish (editor), Coexistence and Reconciliation in Israel: Voices for Interreligious Dialogue, New York, Paulist Press, 2015, 73-85. “L’étau du conflit israélo-palestinien” in Jean-Michel Falco, Tomothy Radcliffe and Andrea Ricardi (eds), Le livre noir de la condition des chrétiens dans le monde XO Editions, Paris, 2014, 308-321. “The Occupation of the Bible: Biblical Authority,” in Naim, Attek, Cedar Duaybis and Tina Whitehead (eds), The Bible and the Palestine Israel Conflict, Jerusalem, Sabeel Ecumenical Liberation Theology Center, 2014, 49-52. “Choose life, horizons beyond the tomb walls,” Thinking Faith (20.4.2017). “Yeshu o Yeshua”, Musaf HaAretz, 6 (24.3.2017). “Zechor et ha-Filipinim (Remember the Filipinos),” HaAretz, 10.2.2017. “Who are the Christians of Israel today,” Jerusalem Bulletin diocesain du Patriarcat Latin 10-12/83 (October to December 2016), 377-388. “Towards the Ends of the Earth: Land in the Jewish-Christian Dialogue,” Jerusalem Bulletin diocesain du Patriarcat Latin 10-12/83 (October to December 2016), 355-370. The new challenges of the Saint James Vicariate,” Jerusalem Bulletin diocesain du Patriarcat Latin 7-9/83 (July to September 2016), 257-261. “L’œuvre Saint-Jacques : Soixante ans,” Proche orient chrétien, volume 66 – 2016, 1/2, 45-59. “Christian Peace-making in Israel-Palestine Today,” Live Encounters (March 2016), 12-17. “Slihah shehitavarnu (Sorry that we were blind),” in HaAretz (Books), 29.1.2016, 10.